I'm getting cranky in my middle age. Either that, or eating out enough to feed a blog and a weekly column has just rendered me the snobbiest snob in Snobville. Whatever the reason, when I see a restaurant touted on best of lists on FoodNetwork.com and a bunch of other foodie sites, I'm expecting a lot. So I recently joined a friend for brunch at Alto Cinco in Syracuse. 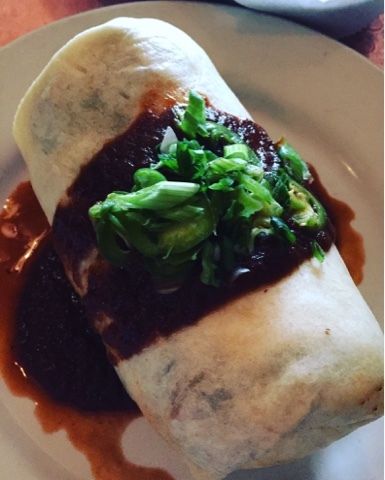 This Mexi-Cali eatery is famous for big burritos and lines out the door. I was worried in advance it wouldn't live up to the hype. Alto Cinco is the kind of place that you'll find rated highly online, showing up on blogger's lists of places not to miss in Salt City, and staffed by folks with lots of piercings and tattoos, so you know they're cool. Look, I don't mean to sneer at all the trappings modern, urban dining - that is, no reservations and hipsters akimbo - because most of it means a democratization of good food in affordable, comfortable settings. But if the food doesn't live up to the pretension? Then we have problems. This is an area in which a lot of SU students reside, which I think may add to Alto Cinco's rep - I, too, ate a lot of average food in college that I managed to elevate to cult status in my own memory. 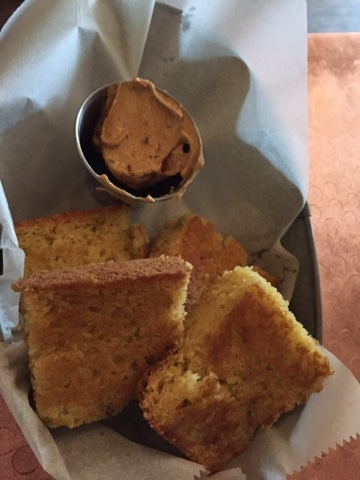 But we started our brunch with jalapeño cornbread, and I liked it, even though it arrived before our coffee, for some reason, and the table we were sitting at was so small, we were already cramped with just drinks and bread. The menu states that you get a choice of chipotle butter or vanilla butter with the cornbread. We were not offered a choice. That said, the bread was good: crumbly rather than cakey, with good, coarse cornmeal flavor and lots of zip from fresh jalapeño chiles. The chipotle butter added a more earthy heat to the jalapeños' sharper spice, and together, this starter became a complex, hearty amalgam of heat, sweet, crunch and chew. Now, I'm a Mexican food freak, and for me, the basis of great Mexican food starts with the meats. I'm talking carnitas, barbacoa, carne asada, al pastor - these are the things I'm craving in my tacos and burritos, but Alto Cinco's menu focuses much more on beans, chicken, brown rice, tofu, and catfish (?) as fillings. I'm not saying all those things can't be delicious, and I understand that this is Mexi-Cali, not authentic Mexican. But I've been to California, and this is not what's on menus out there. Where's the pork? I don't think the photo does the size of this thing justice. You could legitimately put a newborn diaper on this burrito and carry it around like your child. I mean, I decided to just eat mine. My maternal instincts are not that strong. Anyway, I needn't have gotten so excited about the hash browns, because I couldn't taste them. The chorizo didn't do much either, and I wish the poblanos had provided more heat, but really, I tasted beans, the intensely earthy, roasted flavor of the red chile sauce, and the thick flour tortilla, and that was it. Everything else was overwhelmed. I don't know if that's because there were more beans than other ingredients or what, but the flavors were not well balanced in this dish at all. I was disappointed. People are waiting in line for this? It was a $9 burrito, and it was massive, so I can understand why, for most people, it would go in the "good" column. The ingredients were all fresh, handmade, and plentiful. But it didn't actually taste good. Maybe I should have ordered the chiles rellenos or huevos rancheros, but I didn't. I ordered the burrito, and I didn't like it. There, I said it. I realize one shoddy burrito is not a full evaluation of a restaurant, and I would be more than willing to return to Alto Cinco for more eats, but my first impression? Not great. You can keep your long lines, pretentiously aloof service, and tiny tables, Alto Cinco. I'll be at Dinosaur BBQ, Kitty Hoynes, Bistro Elephant, or wherever Gentile is cooking these days having a far superior experience. Maybe I need to public my own Best Of list for The Cuse. My personality is big; my hunger is bigger! Thanks for the info Shelby. now I'll give you some. Iplayed with the band recently at Funk and Waffles on Clinton St,Armory Sq. area. Funk-Yes, Waffles-not so much!